Summary: These figures were better than I had expected, not least because WOR enjoyed the benefits of the weaker post-Brexit pound. However, the software developer did warn that costs would continue to rise — which in turn would keep a lid on earnings for the “foreseeable future”. At least revenue is marching higher while the weaker pound ought to help the group’s progress in the States. The accounts remain simple and flush with cash, and you could argue the underlying P/E is just 5. I continue to hold. I was not anticipating too much excitement from this statement, not least because April’s interim results had already signalled WOR’s full-year profit would be “broadly in line” with that recorded during 2015. In the event, revenue gained 8% to help operating profit climb 16%. However, WOR was very keen to point out that the weaker post-Brexit pound had added £187k to annual revenue and more than £400k to annual profit. WOR claimed its full-year profit would have been nearly 20% down on 2015 had the pound not declined. The lower earnings were caused by greater expenditure on marketing, product development and service delivery — expenditure WOR has now been warning about for the last 18 months or so. At least full-year revenue advanced 5% excluding the Brexit effect, which was not a bad performance when HMRC — one of WOR’s largest customers — reduced its payments by an estimated 36%. The annual dividend was held at 3.5p per share for the eleventh consecutive year. The payout is stingy compared to earnings, but at least it is consistent. And this is how I think H2 would have looked if there was no Brexit boost. I suspect WOR will continue to benefit from the lower pound during 2017, although perhaps not to the extent it did during H2. For 2015, WOR earned 28% of its revenue from the United States and the forthcoming annual report should confirm the percentage for 2016. I can’t fault WOR’s finances. In addition, 2016 witnessed a very favourable working-capital movement that offset the outflows of previous years. It means that, since 2012, WOR has seen a net aggregate inflow of working-capital cash — a very commendable achievement. As a result of the cash generation, WOR’s bank balance has climbed steadily and now surpasses £10m. The balance sheet continues to carry no debt and no pension obligations. Meanwhile, returns on average equity are off the scale if you strip out the cash pile. Such upfront payments are the type of funding all businesses would love to enjoy. 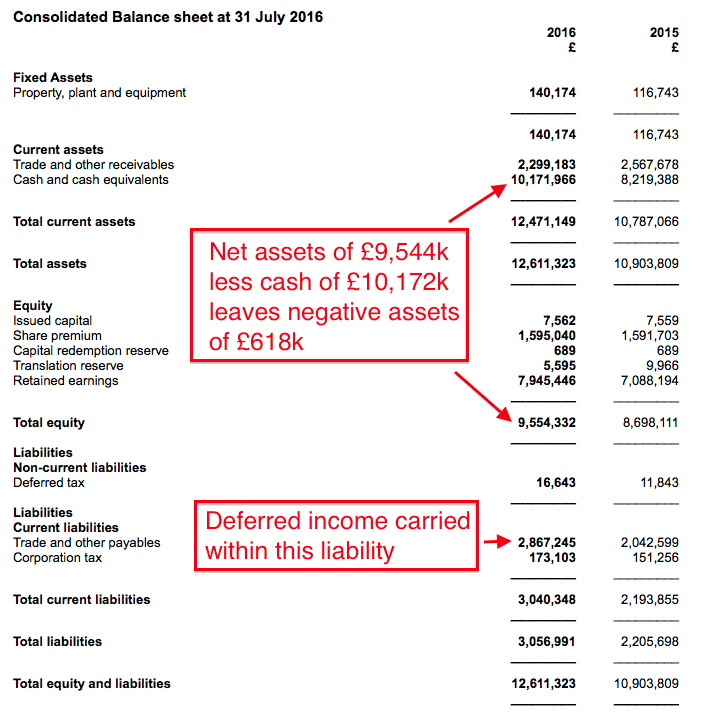 Roughly adjusting for deferred income, I reckon WOR’s underlying cash position is £9.6m, or 127p per share. 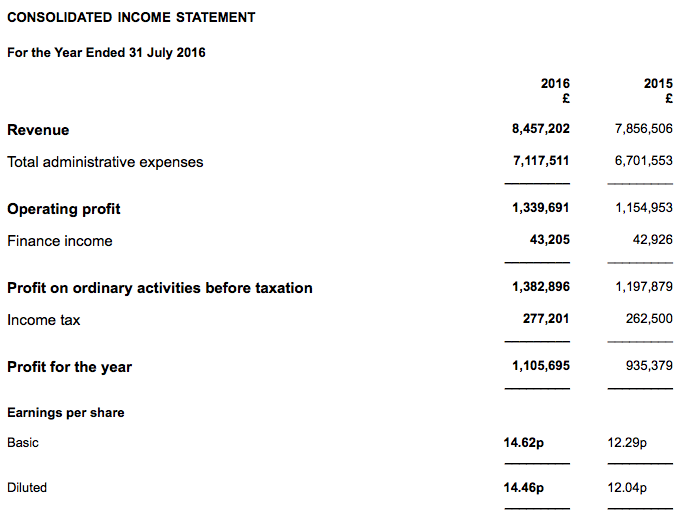 Assuming WOR repeats its 2016 operating profit of £1,340k for 2017, earnings could be £1,072k, or 14.2p per share, after standard 20% UK tax. With the 200p offer price giving a market cap of £15.1m, I reckon WOR’s enterprise value (EV) is 73p per share, or £5.5m. The P/E on my EV and EPS calculations is therefore 73p/14.2p = 5.2. However, adjusting the 2016 result for the Brexit boost, I arrive at an operating profit of £958k and earnings of £766k, or 10.1p per share. The cash-adjusted P/E on that EPS calculation is 7.2. Either way, the shares do not appear expensive — although WOR’s lowly rating has been stubbornly maintained throughout all of 2015 and 2016. “The heavy investments in the second half of last year in the areas I mentioned above have continued into the current year and our cost base is now running considerably higher than last year. But as I have written in the past, WOR has invested in product development at the expense of short-term profit before — and the subsequent pay-off was very handsome indeed. I have my fingers crossed that the same can happen again. I had expected overseas revenue to have advanced quite notably given WOR said extra revenue of £187k was earned purely due to the weaker GBP. As it happens, US revenue increased by £182k and EU revenue decreased by £14k. As such, underlying revenue from the US division — which I had thought was expanding — reduced during the year. However, there ought to be higher US revenue during the current financial year. The average GBP:USD rate was 1.47 during the 2016 financial year and the current 1.24 rate could mean 2017 US revenue comes to £2,846k (up £429k) based on the US division’s figure for 2016. The largest customer note is encouraging. HMRC is WOR’s largest customer and a re-tender of its contract the other year led to a substantial payment reduction. Details here. HMRC revenue down £228k to £1,060k is not as bad as I had feared. I monitor HMRC payments to WOR every month and I had calculated £994k for the 2016 financial year. This note also means non-HMRC revenue climbed 12.5% during the year. That achievement is quite reassuring. As noted in the Blog post above, WOR enjoyed favourable working-capital movements during 2016. Trade receivables represented 25% of revenue for 2016, which compares to 32% last year and between 17% and 27% for the prior five years. So 25% seems in line with historical norms. Deferred income increasing by £438k is encouraging. The advance suggests there is more revenue in the pipeline than this time last year, which I trust bodes well for 2017. I reckon it’s option ii), in light of this announcement in May. 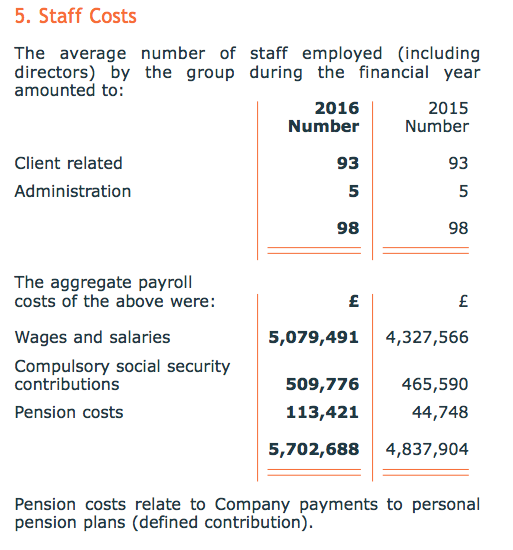 The headcount remains at 98 and the average employee cost is £58k vs £49k for the prior four years. Let’s just hope the higher pay does indeed produce higher revenue. The chief exec — and 72% shareholder — continues to enjoy a fair whack for a business that at its 2014 peak earned only a £2.4m operating profit. 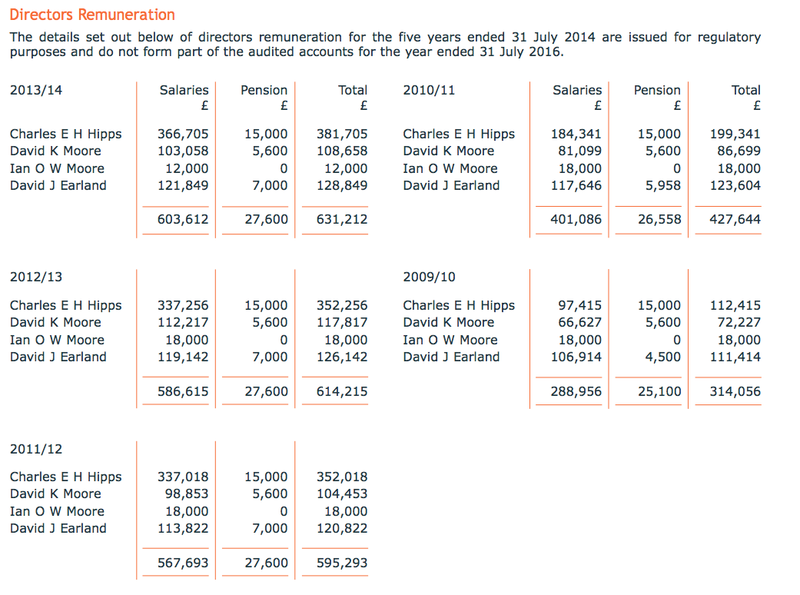 The remuneration table certainly indicates who is in charge here. It seems the chief exec may have collected up to £100k bonuses in prior years. But I see he was not vastly paid during WOR’s lean years of 2010 and 2011. Here’s the danger when you back companies with a controlling shareholder — sometimes you suddenly face a ‘fiefdom’ risk. The AGM small-print is all very odd. Apparently, the chief exec did not participate in the board discussions as to whether the company should buy the freehold or not. And if he does buy the property, he won’t then participate in board discussions about rents, leases and tenancies etc. 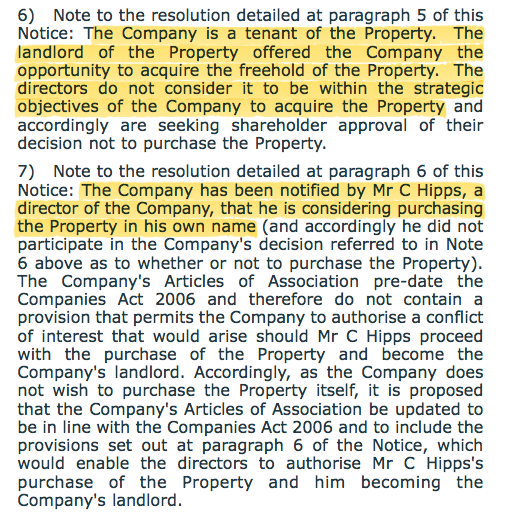 And yet…(and the AGM notes do not say otherwise), the chief exec can vote his 72% shareholding to approve the resolution of the company not to purchase the freehold. Anyway, this looks a done deal and I am left in two minds. ii) the chief exec is about to save WOR from paying a hefty sum with little in return from rent savings. The freehold is located in Wimbledon, London, and 2016 lease costs of £100k-plus suggest a purchase price in excess of £2m. I suspect if i) was the option, then the chief exec would not have already built up £10m in WOR’s coffers — he would have extracted that money through dividends already. Plus, if i) was the option, then why bother proposing the deal to the AGM? The AIM rules are seemingly so lax that the chief exec could have simply bought the freehold and the first outside shareholders would have known about it would be through a related-party transactions note in the 2017 annual report. Wishful thinking perhaps, but I do hope it is option ii). I continue to monitor the monthly expenditure updates from HMRC, WOR’s largest customer). For the current financial year (to 31 July 2017), HMRC has paid £224,064k cash to WOR. On an accrued revenue basis, the total so far is £168,048 (£56,016 for both August, September and October 2016). This time last year, WOR had started to earn other fees from HRMC alongside the standard £56,016 monthly service charge. HMRC’s payments can be very tardy, so the next few months may be indicative as to whether WOR has sustained its income from its largest client. Collecting only the monthly £56k fee gives £672k annual income — versus c£1m earned in the prior financial year. For the current financial year (to 31 July 2017), HMRC has paid £280,080k cash to WOR. On an accrued revenue basis, the total so far is £224,064 (£56,016 for Aug, Sep, Oct and Nov 2016). At this time last year, WOR had started to earn other fees from HRMC alongside the standard £56,016 monthly service charge. HMRC’s payments can be very tardy, so the next few months may be indicative as to whether WOR has sustained its income from its largest client. Collecting only the monthly £56k fee gives a £672k annual income — versus c£1m earned in the prior financial year. First of all congratulations on a great site – I’m new to it and really enjoying it. With regards to WOR, the fundamentals certainly look appealing but the stand-out issue is the incredibly low free float at around 4.5% (£750k of float), manifesting itself in a 30% bid/offer spread). Have you spoken to management on the float? And have they ever indicated their plans for longer term growth in free float? At the moment this looks like a private company with a small token float just to satisfy staff who want options / equity in the company. This looks like the main reason it has always remained stubbornly cheap, and I’m not sure that will change unless there is material improvement in liquidity in the stock. Separately, has there been any indications of uses of that cash? Either inorganic growth or special dividends (the low float obviously rules out buybacks – otherwise ideal here ). Thanks for the Comment and I am glad you like my Blog. Essentially the boss is happy not to sell and presumably is more concerned with running the business. I quite like that. I am happy to be patient with this investment. I am sure that if the business can do well over time, more investors will naturally become interested in the shares and ultimately the price will have to rise if, as an extreme example, the growing cash pile exceeds the market cap. It too had a large executive shareholding, a wide bid-offer spread and a stubbornly lowly rating, although the free float then was larger than WOR’s is now. Anyway, good progress at this other obscure share has prompted the price to more than 10-bag since. It now trades at a P/E of 20-plus, versus about 6 more than 10 years ago. I am not saying WOR will 10-bag, but at least I have seen one share that has shaken off its lowly rating due to an illiquid share base, simply because its underlying businesses became much bigger and more difficult for the market to ignore. WOR’s management did not express any uses for the cash, other than it is useful to have it on standby as business performance can vary from year to year. As a small software supplier looking at larger customers, I get the impression that it is useful for WOR to have cash in the bank to help persuade the client that the services your promise will be delivered. Also, I have been told that some clients do like WOR’s quoted status as, again, it gives them a bit more insight about WOR’s resources and ability to deliver. Thanks for the colour – it does look an extremely cheap and interesting opportunity. With around 10% of sales invested into growing staff costs (accounting for much of the hit in EBITDA from around 25% to low teens), you can see that there is investment in this business. I’m also assuming there has been a mix shift in staff rather than everyone just getting a pay bump! Interestingly, looking at the Glassdoor former/current employee reviews of WOR, I notice that reviews back in 2014 noted that the company was great to work for but needed more investment in the business; the ongoing spend perhaps suggests that the investment is very much in line with the thinking of wider employees in the business – the investment comments seem to have disappeared with uniformly positive employee reviews in 2016. Thanks for the Glassdoor info — I have never really looked at that site. I recall writing a Comment on one of my past WOR Blog posts that the group had announced hiring senior sales and finance people to help the group’s “global ambitions”. So yes, I think there has a slight mix in staff. With the US, I get the impression from WOR’s Twitter feed that the business does have sales people based in the States — I suspect offices there may be very small or even back bedrooms. All the development work is handled in the UK. The US sales jump may be due to how the group sells its software — typically larger fees are earned initially from the implementation work and then smaller fees are collected subsequently from annual service/maintenance efforts. I suspect the US division may have enjoyed a large implementation fee one year, which has not been repeated. This statement clarified what is happening with the group’s head office. WOR had previously informed shareholders via an AGM resolution (see an earlier Comment above) that its boss wished to buy its office freehold. “Further to the notice of annual general meeting, the Company has been informed that Charles Hipps, the Company’s Chairman and Chief Executive Officer and holder of approximately 71.46% of the Company’s issued share capital, has acquired, through his self-invested personal pension, the office at 5-7 Bridge Works, 206 Durnsford Road, London SW19 8DR (the “5-7 Bridge Works Building”) from an unrelated third party. 5-7 Bridge Works Building together with 3, 6 and 8 Woodman Works, 204 Durnsford Road, London SW19 8DR (the “3, 6 and 8 Woodman Works Buildings”) comprises the Company’s UK head office. The Company’s existing lease on the 5-7 Bridge Works Building was for four years and expires on 4 February 2017 and the rent payable under this existing lease agreement is £84,550 pa excluding VAT. I.P.M. Personal Pension Trustees Limited is the trustee of Charles Hipps’ self-invested personal pension (the “Landlord”). The Company has entered into a new lease agreement with the Landlord in respect of the 5-7 Bridge Works Building (the “Lease Agreement”). Under the Lease Agreement, the lease term is for 10 years from 5 February 2017, with a break clause after 5 years that either the Landlord or WCN can terminate. The rent payable is £95,000 pa excluding VAT, with no rent-free period. The rent has been determined by an independent surveyor acting for WCN. The Lease Agreement contains an upwards only rent review on 5 February 2022. The rent will be reviewed to the higher of existing rent and open market rent. WCN also has the right to terminate the Lease Agreement after 5 years with 18 months’ notice in the event that WCN’s leases on 3, 6 and 8 Woodman Works Buildings are terminated by the landlord if the landlord exercises its right to redevelop such building. The Landlord also has the right to terminate on 18 months’ notice following the initial 5 year period in the event that the Landlord wishes to redevelop the 5-7 Bridge Works Building. It reads as if the annual rent on the main part of the HQ will rise from £84,550 ex-VAT to £95,000 ex-VAT — a 12% lift. An extra £10k a year ought not to break the bank. Total lease costs for 2016 were £139k. I will endeavour to discover how much the building was sold for. For the current financial year (to 31 July 2017), HMRC has paid £336,096k cash to WOR. On an accrued revenue basis, the total so far is £280,080 (£56,016 for Aug, Sep, Oct, Nov and Dec 2016). At this time last year, WOR had earned additional fees totalling £229k from HRMC alongside the standard £56,016 monthly service charge. It seems to me that this current financial year may not be so lucrative for WOR with regards to HMRC payments. Collecting only the monthly £56k fee gives a £672k annual income — versus c£1m earned in the prior financial year. For the first time since July 2016, HMRC has paid WOR for an additional service. This time it was £37,483 for online recruitment tests. HMRC’s usual monthly fee to WOR is £56,016. Anyway, for the current financial year (to 31 July 2017), HMRC has now paid £429,595k cash to WOR. On an accrued revenue basis, the total so far is £373,579 (£56,016 for Aug, Sep, Oct, Nov, Dec, Jan, as well as £37,483 for Jan). At this time last year, WOR had earned additional fees totalling £260k from HRMC alongside the standard £56,016 monthly service charge. As I noted last month, it seems to me that this current financial year may not be so lucrative for WOR with regards to HMRC payments. Collecting only the monthly £56k fee — plus the recent £37k extra — gives a £704k annual income, versus c£1m earned in the prior financial year. Encouraging news. HMRC has paid WOR a sizeable sum for an additional service. This time it was £246,031 for the implementation of ‘sift tools’ for recruitment. I understand these tools are for psychometric testing on prospective civil servants. Notably, HMRC’s usual monthly fee to WOR of £56,016 was not paid. Anyway, for the current financial year (to 31 July 2017), HMRC has now paid £675,625k cash to WOR. At this time last year, WOR had earned additional fees totalling £260k from HRMC alongside the standard £56,016 monthly service charge. I make additional fees for this year to be £283k. So perhaps this current financial year could be just as lucrative for WOR with regards to HMRC payments after all. Collecting only the monthly £56k fee — plus the recent £283k extra — gives a £955k annual income, versus c£1m earned in the prior financial year.